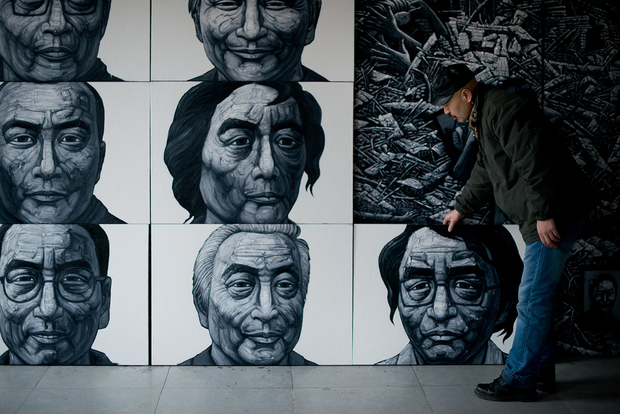 Artist Liu Yi arranges paintings showing the faces of Tibetan self-immolators at his studio on the outskirts of Beijing in this archival photo from 2013. This piece was first published on the NYR Daily on January 11, 2016. 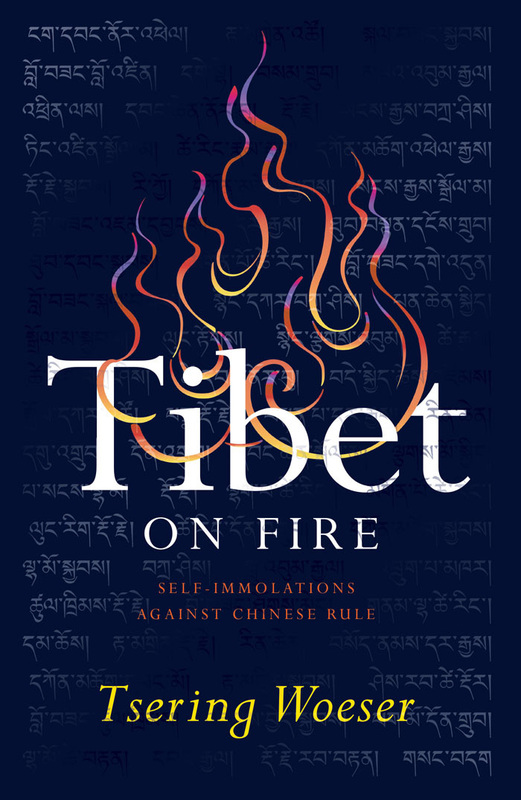 This piece is adapted from Tsering Woeser’s Tibet on Fire: Self-Immolations Against Chinese Rule, translated by Kevin Carrico, which will be published by Verso on January 12. February 27, 2009, was the third day of Losar, the Tibetan New Year. It was also the day that self-immolation came to Tibet. The authorities had just cancelled a Great Prayer Festival (Monlam) that was supposed to commemorate the victims of the government crackdown in 2008. A monk by the name of Tapey stepped out of the Kirti Monastery and set his body alight on the streets of Ngawa, in the region known in Tibetan as Amdo, a place of great religious reverence and relevance, now designated as part of China’s Sichuan Province. At least 145 other Tibetans have self-immolated since then. Of these, 141 did so within Tibet, while the remaining five were living in exile. According to the best information we have, 125 have died (including 122 within Tibet and three abroad). Most of these individuals are men, though some are women. Many were parents who left behind young children. The oldest was 64, and the youngest was 16. Seven underage Tibetans have either self-immolated or attempted self-immolation; two of them died, and two were detained and their fate is unknown. The numbers include three monks of high rank (tulkus, or reincarnated masters), along with 39 ordinary monks and eight nuns. But many were ordinary people: 74 were nomads or peasants; among the others were high school students, workers, vendors, a carpenter, a woodworker, a writer, a tangka painter, a taxi driver, a retired government cadre, a laundry owner, a park ranger, and three activists exiled abroad. All are Tibetan. These events constitute the largest wave of self-immolation as a tool of political protest in the modern world—yet there is no such tradition in Tibetan history. How did we get here? The cover of ‘Tibet on Fire,’ which was designed by Ai Weiwei. Recent decades have brought increasingly extreme oppression to Tibet’s third generation under Chinese rule. This oppression is primarily manifested in five areas of Tibetan life. First, Tibetan beliefs have been suppressed, and religious scholarship has been subjected to political violence. The dispute over the reincarnation of the tenth Panchen Lama in 1995, in which Beijing selected its own Panchen Lama and placed the Dalai Lama’s chosen appointee under house arrest, created the world’s youngest political prisoner and produced an irreparable break in relations between Beijing and the Dalai Lama. A similarly paranoid decision in 2008 to expel all monks who were not born and raised in Lhasa from the city’s three main monasteries (Drepung, Sera, and Ganden) was one of the main factors leading to the protests that spread throughout the region that March. After the 2008 protests, a “patriotic education” program, forcing monks to denounce the Dalai Lama openly, was intensified and expanded beyond Lhasa to cover every monastery across Tibet. Outside of the temples, the people of Tibet face regular searches of their residences: images of the Dalai Lama are confiscated from their homes, and there have even been cases of believers being imprisoned simply for having a photograph of His Holiness. Second, the ecosystem of the Tibetan Plateau is being systematically destroyed. The state has forced thousands to leave behind the sheep, grasslands, and traditions of horseback riding with which they have practiced for millennia to move to the edges of towns, where they remain tied to one place. In their wake, a sea of Han workers has arrived from across the country armed with blueprints, bulldozers, and dynamite. They have immediately gone to work on the empty grasslands and rivers, mining copper, gold, and silver, building dams, and polluting our water supply and that of Asia as a whole (in particular, the upper reaches of the Mekong, Yangtse, and Yarlung Tsangpo rivers). The result of this “development” has been widespread pollution and increasing earthquakes, avalanches, debris flows, and other disasters. His Holiness’s words shocked Tibetans, who had been waiting patiently, year after year, for any sign of real progress. The Dalai Lama suddenly acknowledged what Tibetans living in Tibet had long known: not only had there been no progress, but life in Tibet had only become more oppressive. The monks of the Sera Monastery near Lhasa were among the first to hear the Dalai Lama’s comments, and they immediately came to an agreement: “We must stand up!” They took to the streets, carrying the Tibetan flag and shouting slogans for freedom, launching the first stage of the protest movement that would rock culturally Tibetan regions in the coming weeks. That same afternoon, hundreds of monks from the Drepung Monastery—another of the capital’s three historic monasteries—came down to the center of Lhasa from the hillside in protest. They were followed in the following days by monks and nuns from all of the monasteries across the city. Once these protests had emerged, they grew and spread quickly. A common, cynical view of the events, which are known in China simply as the “March 14 Incident” and portrayed in social media as an unprovoked riot by ungrateful savages, blames protesters for all of the oppressive government actions that followed in their wake: the cruel repression, the tightening of security restrictions and expansion of police posts and checkpoints, and the transformation of Tibet into an open-air prison patrolled by omnipresent armed military police, armored personnel carriers, and surveillance cameras. But blaming protesters for state suppression is like arguing that the slave-driver uses his whip only because the slave has been disobedient; if we see the world through such a lens, the slave will always remain a slave. Just as monks were integral in leading the struggles of 2008, they have also taken the lead in initiating and developing self-immolation as a form of protest. The first 13 cases of self-immolation were all carried out by monks or former monks who had been driven out of their monasteries by the authorities. Only in December 2011 did a layperson first commit self-immolation, further expanding the scope of this protest movement. In the first quarter of 2012, 15 out of 20 self-immolators were monks; but by the second and third quarters of 2012, the majority of self-immolations were carried out by laypeople. In the first 70 days of the fourth quarter of that year, 43 out of 50 cases of self-immolation involved laypeople. In 2013, 16 of the 28 cases of self-immolation were also carried out by laypeople, as were seven out of 11 in 2014, and four out of six in the first half of 2015. With the passage of time, people from various walks of life and backgrounds across Tibet have become increasingly involved in this attempt to press for change. Reviewing the events of the past six years, we find that the single month with the most incidents of self-immolation was November 2012, when a total of 28 men and women, both young and old, engaged in this final act of protest. The month with the second-highest number of incidents was March of the same year, when 11 Tibetans set their bodies alight. Six were monks, while the other five included high school students and parents of young children. It is worth examining why there were spikes at these particular moments and what they might tell us about protesters’ goals and demands. Looking first at March 2012, we should note that March has long been a politically charged month in Tibet. March 5, for example, marks the anniversary of the suppression of protests in Lhasa in 1989, when People’s Armed Police soldiers opened fire on peaceful protesters who had been gathering for weeks on the streets of Lhasa. March 10 is Tibetan National Uprising Day, commemorating the uprising of 1959 following the Dalai Lama’s escape to India. March 14 is the anniversary of the beginning of the protests that spread across Tibet in 2008. March 16 is the anniversary of the state’s brutal crackdown on protesters in Ngawa in 2008. And since 2009, March 28 has been designated by the Chinese government as Serfs’ Emancipation Day—an official holiday meant to commemorate and “celebrate” the C.C.P.’s supposedly benevolent liberation of the Tibetan people. On account of this surplus of sensitive dates and the politically charged atmosphere they create, the authorities are reliably on guard for any signs of unrest every March. Indeed, the vast majority of protests in Tibet are concentrated in this month. As for November 2012, the peak in self-immolations at this point coincided with the 18th National Congress of the Communist Party, at which the new generation of state leaders was to take control of national policy. Twenty-eight Tibetans engaged in self-immolation, nine doing so in the days before and during the Party Congress. The revealing pattern of self-immolations at this politically significant moment clearly suggests that protesters hoped to press the new generation of leaders to change their policy in Tibet, and that they viewed self-immolation as a means of pressing for such change. An understanding of this point is essential to an understanding of the act of self-immolation itself. Attempts to label these acts as suicide—or even, curiously, as a forbidden act of “killing”—are either a complete misinterpretation of the phenomenon or, more likely, the type of deliberate misrepresentation that we see all too often in Chinese state propaganda. A high-ranking monk once confided in me very clearly: “The cases of self-immolation in Tibet absolutely do not violate our Buddhist teachings on killing. They are not in any way opposed to Dharma, and certainly do not violate it. The motivations of self-immolators in Tibet, whether monks or laypeople, have nothing at all to do with personal interest…. These acts are meant to protect the Dharma and to win the Tibetan people’s rights to freedom and democracy.” Self-immolators are bodhisattvas sacrificing the self for others, phoenixes reincarnated from the flames of death.